By far my favourite artist is Salvador Dali, a rather eccentric and often controversial character most famous for his bizarre surrealist works. As it’s Christmas, and therefore slightly topical, here’s one of my favourite (although less surreal) paintings from the Master ‘the Crucifixion (‘Corpus Hypercubus’) painted in 1954. 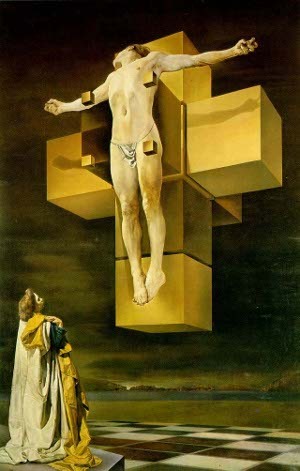 An analysis of the painting and a gallery of most of his work (1910-1983) can be found on the Salvador Dali Painting Gallery. Somewhat irritatingly directs to the home page, click ‘Art Gallery’ in the footer, then from ‘Showcase’ click ‘Paintings’. Should you find yourself in Paris with a couple of hours to spare, it’s worth checking out the rather good museum L’Espace Dali (just off the Butte Montmartre at 11, rue Poulbot), which contains many of his drawings, cartoons, sculptures and a few paintings. I think my favourite is ‘Disintegration of the persistence of memory’ which can be seen on my Google+ profile. Hope you had a pleasant and peaceful Christmas kinsman. Thanks for the sentiment GA – hope yours was good too. Here’s hoping we all have good luck in the New Year..!